Here are the best tips and tricks to playing the Toxic Trapper. To excel in Apex Legends, players must understand each of the game’s eight characters and their respective playstyles. As one of two designated defense classes, Caustic relies on tricks to best his enemies—and with the right setup, anyone can easily secure the win with this Toxic Trapper. Before playing Caustic, players must first unlock him. 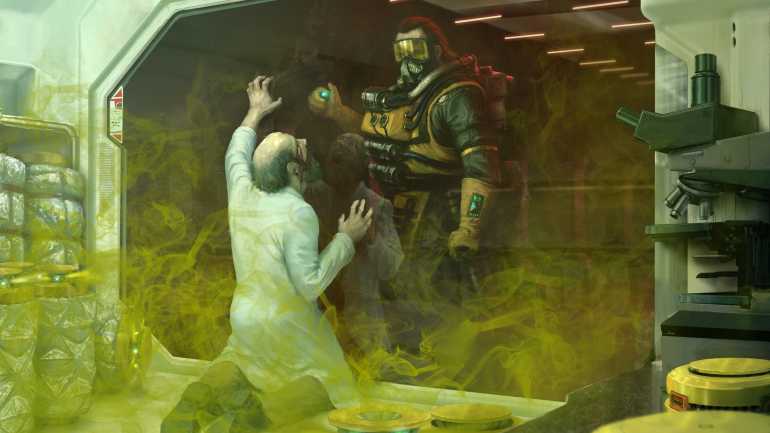 Caustic is one of two characters in Apex that needs to be purchased before playing, and players can do so by unlocking the Toxic Trapper for 12,000 Legend Tokens or 750 Apex Coins. Caustic’s passive grants him vision over enemies trapped in clouds of poison gas. This ability works best in close-quarters, such as small rooms where enemies can’t easily escape the range of Caustic’s abilities. Only Caustic will be able to see the outline of enemies, so be sure to alert teammates about their location in the poison gas. Since enemies can’t see through the gas, Caustic players can use it as cover to revive teammates or quickly heal. The Toxic Trapper comes equipped with a gas mask, so he can’t be poisoned by his own abilities. As such, Caustics can’t be damaged by other users’ Nox Gas and vice versa, meaning players’ tricks won’t be effective against other Caustics. Caustic’s tactical ability places canisters that release poison gas in a small vicinity when shot or triggered by nearby enemies. Traps are best used either in the early or late game. Players can leave canisters in locations packed densely with loot-hungry opponents or take advantage of late game rings by packing a compound full of traps to catch enemies off-guard. Canisters take about one second to become activatable, but once placed, they can be picked up and relocated. Caustic stores three canisters at once, and upon using all three canisters, players must wait 28 seconds before being able to place another. Up to six canisters can be placed at a time, so placing a seventh will remove the first from the field of play. The canisters can also be used to block doors from being opened. Placing a trap on one side of a door prevents a player from opening the door on the opposite side. Caustic can hide traps in a building with two exits, blocking one door with a canister and leaving the other open to bait enemies in. When enemies enter the room, Caustic can throw in his ultimate, close the second door, and block it with another canister. This tactic does require some set up and can be easily sniffed out by the enemy team, so be sure to place canisters quickly and quietly. For his ultimate ability, Caustic throws a grenade that releases a cloud of Nox Gas that has a much larger range than that of his Nox Gas Traps. Unlike his traps, the grenade can be thrown a sizeable distance away from Caustic. Caustic players need to carefully plan and set up their attacks to take advantage of his abilities, but they can be used in the heat of the moment as an effective escape tool. The best characters to pair with Caustic include Bloodhound, who can use his own ultimate ability to see through the Nox Gas, and Lifeline, who can attract enemies to one area by summoning a high-priority care package.